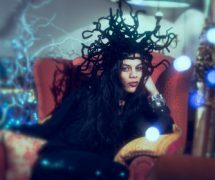 Upon first glance, Volente (pronounced Volent-eh) – seems to be a strange mixture of artists; the use of a lovely twig hat brings comparisons to Bjork and, no doubt about it, Lady Gaga. 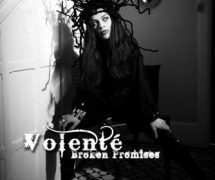 But we – well, me, but you’re welcome to draw your own conclusions – mustn’t judge the brilliant named Volente on that image displayed for her single, Broken Promises. We are here to review the music. And review the music we shall. Unfortunately, let me be the first to say that that, my friend, is a lie. ‘Broken Promises’ is neither brutal or bittersweet and it is most certainly not an anthem. While it certainly has its operatic moments, I wouldn’t exactly call them ‘soaring’ (or even class some of them as vocals but that would be mean since Volente has, I’m sure, worked very hard on this etc) so please, banish that description from your mind immediately. And let it be known that ‘Broken Promises’ isn’t really that good. At all. Volente’s high, almost dream-like vocals grate against the track’s electro, drum’n’bass, nearly-dubstep backing track. It all rather makes for an uncomfortable listening experience. It either feels like as if Volente is a) singing eight octaves too high or b) the backing track isn’t suited to her voice at all. I would, in all honesty, opt for b. Broken Promises is a curious beast; think of it as a low-par demo track for Lana Del Rey – minus her soaring, cinematic, Americana glory – mixed with an underground, post-90s drum’n’bass / dubstep harmony that does not compliment Volente’s vocals at all. Were this an acoustic track, I think I would find Volente’s voice child-like, dream-like and comforting. But the heavy drum’n’bass incorporated into this track doesn’t suit her vocal range. I find ‘Broken Promises’ wants to be many things; from the intro I caught a whiff that Volente could possibly be setting herself up to be a bit like Jessie Ware, you can definitely feel like Volente’s trying to put across this mysterious, ‘child of nature’ persona – which doesn’t work effectively – to try and be South Wales’ answer to Lana Del Rey with an off-key indie vibe. Through this song, it can be assured that Volente, sadly, achieves none of these things. Although she does, I think, channel Kate Bush quite well, no? The structure of the song is also annoying me. Songs such as the masterful ‘Biology’ by Girls Aloud have taught us that songs don’t need to follow the stereotypical ABBA verse-chorus-verse format but I think a bit of this formula is what would help ‘Broken Promises’ hone Volente’s identity in the track. The song is, at the moment, a jumbled, incoherent mess. You can’t distinguish words from Volente’s background groans and you can’t help but feeling that a chorus – an epic, anthem-like haunting chorus – is what would set this song alight and link together all of what Volente wants to achieve. But, that being said, the song is moody enough to give Volente the tiniest shred of identity and her harrowing calls – more like the war cry of an injured, angry cat actually, apologies – are repeated often enough that they are certainly imprinted onto your memory for the near future. This track sees Volente trying to achieve certain aims but with an eclectic mix of genres – at a guess I counted indie, classical, opera, dubstep, drum’n’bass – and styles that don’t at all mix, they give this singer little identity, meaning or purpose. And at 5:03 it’s not just too long, it’s way too long. This can be considered to be a ‘lighter’ track compared to the previous one, but Volente’s high voice – when heard in harmony with herself – only makes the listener cringe and shudder, especially on one exceptionally high note that I’m sure only dogs could hear at certain points. The beginning of the song actually starts off quite promising, with Volente’s voice growing in harmony with the piano and a guitar. But when the main backing track is shoved in, the whole thing falls to pieces. The backing track in itself is not catchy, more of a generic drum’n’bass kind of thing, that pales in comparison to the short burst of beauty sampled at the beginning of the track. I have to admit, for most of the song, you don’t really know what she’s singing about but I will say this; the song’s running time of 3:22 did pass by rather quickly. I was rather hoping at the start of this track that the change in tone would help Volente establish more of an identity – maybe in a stroke of genius, her twig hat was not just a hat but an instrument as well? – but, if anything, the lighter tone of this track obscures Volente’s identity even more. What genre is she trying to claim? Opera? Indie? Drum and bass? Classical? Volente dips her toe into many ponds but never fully submerges into a single one, instead we’re left with this odd melting pot of mismatched genres that is the Broken Promises EP. Let’s just state straight away that my hopes were dashed. This is not – repeat NOT – a cover of the Beyonce song End Of Time. 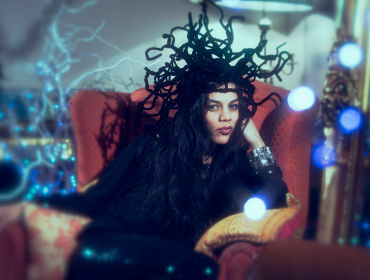 Instead, this sees Volente crash into yet another genre with her weird yet fabulous twig hat. The previous tracks – Broken Promises especially – contained faint splashes and echoes of dubstep, yet it’s through End Of Time that dubstep Volente, a superhero if there ever was one, somewhat emerges. Volente’s operatic harmonies, especially when matched with the darker notes of the dubstep used in this track, create a weird and jarring experience. This odd coupling of dubstep and opera may be a statement by Volente claiming that she is an independent and original artist – for it is true, she is no Pixie Lott *sigh* – but this is one independent and original artist that doesn’t appeal to the ears. So sorry Volente, I’m trying to be nice to you, I know you must have worked hard and all that. But there’s not a comfortable note held in this song; there’s an especially wobbly rendition of the word ‘siiiiide’ which just really confused me. There’s a brief second half of this track that takes a turn for the strange. It abandons most of the dubstep and Volente sings in high notes yet again and channels her inner Kate Bush – yet another artist that Volente seems to want to incorporate into the ‘musical experience’ that is the Broken Promises EP, but this Bush gamble doesn’t pay off at all. However, it’s worth noting that part of the dubstep beat is quite catchy but in this closing number Volente yet again feels the need to not incorporate a chorus. End Of Time could be the best track on here, but its weird mix of genres make it a stand-out track for all the wrong reasons. Yet this promise is broken time and time again throughout this collection of three songs. Volente’s been around for a quite a while, you know. I did a Google search on her. And you would have thought that she would have, by now, found her own identity as an artist. Maybe she has. Maybe this is the identity she has chosen for herself; warbling, dubstep-opera-nymph-Queen of the Forest. But it’s an identity that is totally lost amongst a collection of bizarre, weird and jarring songs that make the reader feel a little glad to exit the world of Volente. Let’s face it, she ain’t no Natalia Kills. 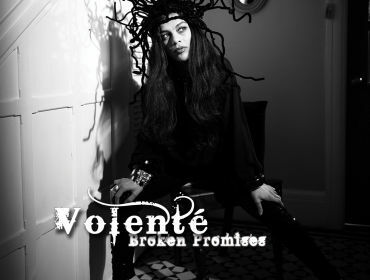 Volente’s Broken Promises is out on the 25th March. You can listen to it on Volente’s SoundCloud.